Aktun Chen Parque Natural is a natural park that places you right in the heart of lush green tropical rainforest. The park is a scenic beauty with an underground river and several cenotes available for you to explore. Many agency also conduct adventure tours in the park that include zip-lining, hiking through the forest, and snorkelling. A tour of the cenotes is a mesmerizing experience while swimming in the crystal clear waters adds to the bliss. 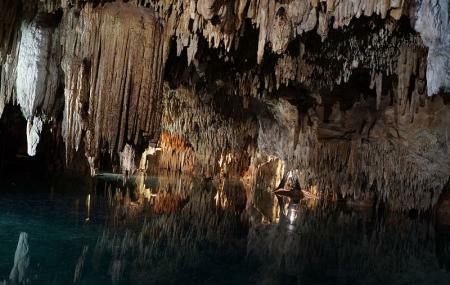 The cenotes are packed with stalactites and stalagmites that are an absolute wonder to observe. Walk through the forest and you will encounter a few wild animals too. A visit to this park will let you breathe in fresh air and surely help you unwind. Visit this place along with friends or family and return with an unforgettable experience. Love this? Explore the entire list of places to visit in Akumal before you plan your trip. Fancy a good night's sleep after a tiring day? Check out where to stay in Akumal and book an accommodation of your choice. Great experience! It was amazing having so much to do in one place, we were stressed about having to go to different places for different things but this place had adorable animals (monkeys, boats, birds, deer, peacocks), super fun zip lining, an amazing cave tour and the underground pool for swimming was very beautiful! Their staff and guides were super nice and fun and friendly, our guides Alexis and Josué made the zip lining extra amazing and our cave guide Ricardo was very knowledgeable. The photographers are great too, they are very fast with getting the photos ready and can easily get them to you with airdrop and other Android-friendly methods, and the pictures are amazing! 10/10 experience. The water was beautiful and very chilly. I especially enjoyed the zip like jump into the preserve. I enjoyed snorkeling through and under. This place has been protected in it's original natural formations and it's simply a dynamic view. I was skeptical at first because this place offers three different activities (dry cave, cenote swim, and zip-lining) but does not force you to choose a reservation time for each/any activity. You simply buy your tickets online or at the place (don't worry, it's not a place where there's a huge line out the door, people come and go and there's no pressure to buy anything) and then the staff are so well coordinated that they will organize everything for you. It also seems they have a great memory for the guests' faces, so if you are lost they will notice and find you and bring you to your next activity. Also, the food at the restaurant was so good!!! If you go, it's probably best to do all three activities plus the lunch. It's well worth it and they also take lots of photos of you which you can buy at multiple locations. They are also very tech-savvy and the all the tour guides are very helpful with taking family/group photos to savor the memories. Love it! Must see... Don't just read about. Go see and experience it. I thoroughly enjoyed it.